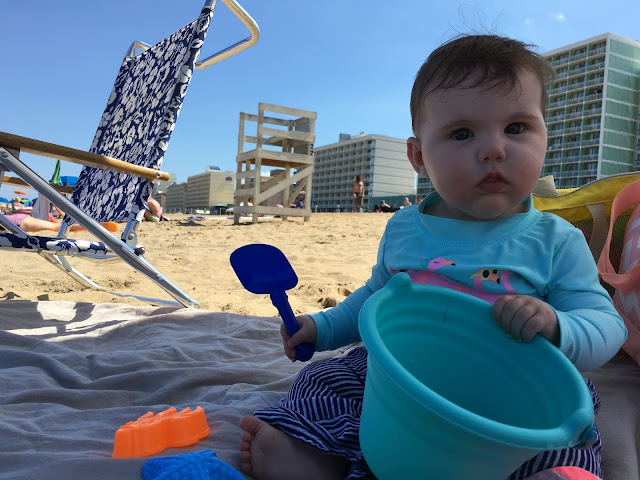 I had the pleasure of visiting Virginia Beach earlier this month as the first vacation of my six-month old daughter’s young life. Planning this trip introduced me to the wide world of family travel, something I hadn’t really paid much attention to in the past. Joining my wife, daughter Florence and I on the adventure were my wife’s parents as well as my bother-in-law with his wife and two children, five and three. The 12 hour (15 with stops) road trip from southern Ontario wasn’t always easy with the little ones in our group, but hey the journey is half the fun and we all survived! When planning, we noticed that hotels along the boardwalk were quite expensive, with even mediocre-rated options well over $150 CAD per night. After some serious research we decided to book a rental property through VRBO. We chose a modern 4-bedroom townhouse just a few minute walk from the center of the boardwalk and the beach. The home was gorgeous, location prime and given the aforementioned cost of a hotel, the value superb. The main activities in Virginia Beach center around the boardwalk and of course the beach. I absolutely loved their boardwalk. It stretches for about 4.5 KM along the Atlantic coast where a hub of activity is taking place from top to bottom. 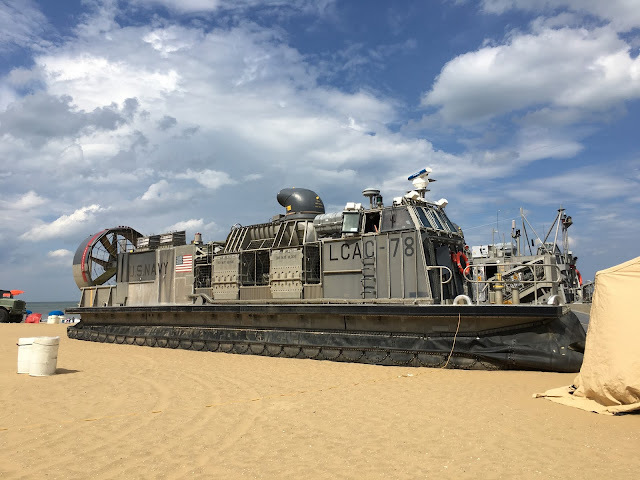 The weekend we arrived was the popular ‘Patriotic Festival’, and while we didn’t stick around for the country concert at night, I enjoyed checking out the military exhibit on the beach during the day. The highlight of which was a US Army hovercraft parked at the water’s edge which could be boarded and explored. The weekend we left was a major beach soccer tournament with teams from all over the world, so needless to say the strip was always action packed. How often do you get to see one of these up close? 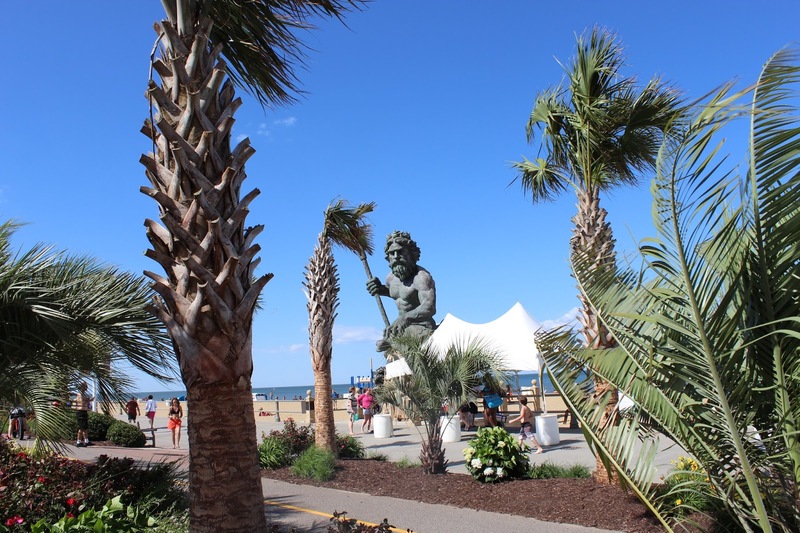 Regardless of which events are going on, the crown jewel on the boardwalk is the statue of King Neptune, located just north of the centre of the strip at 30th street. 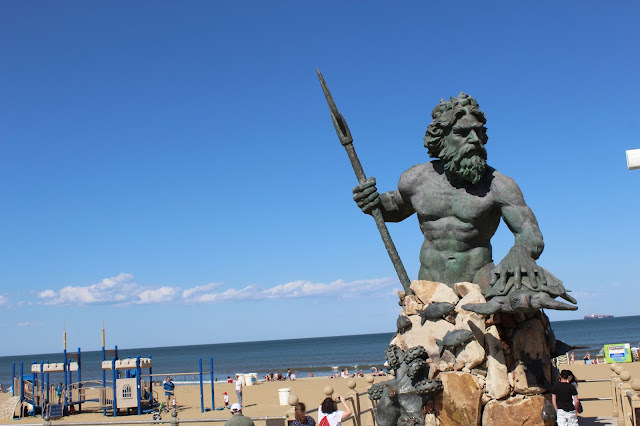 Great photo op’s are abound around the mighty sea god, but be sure to come early as his section of the path gets quite crowded with camera-happy tourists in the afternoon. The boardwalk also features a bikes-only path which is great for cyclists and also keeps the main path free for walkers and runners. 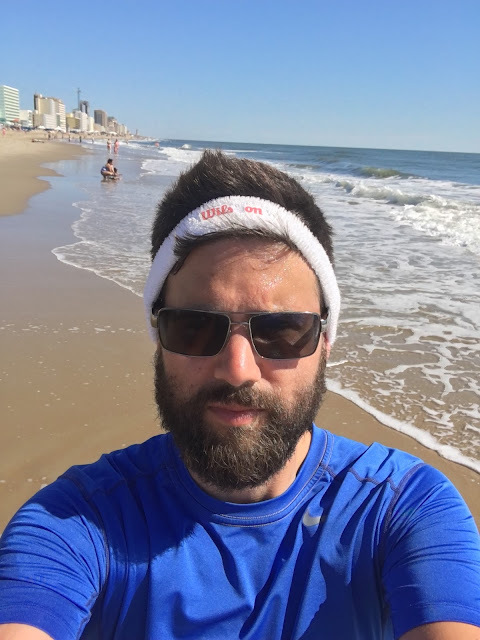 I ran the boardwalk several times in the week I was there and it definitely ranks up with some of the best running routes I have done. (I will go more in-depth with my running experience in a follow-up post soon!). Finishing up my run on the beach. 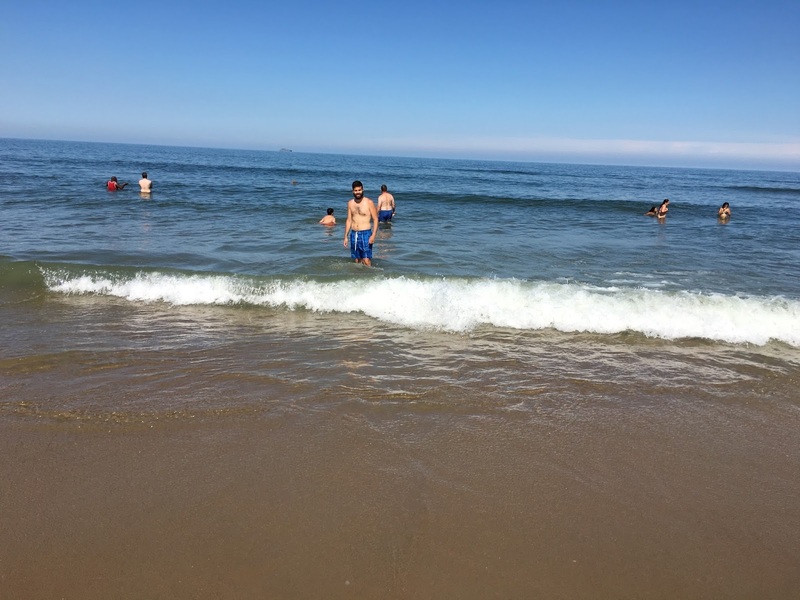 Even more than the famous boardwalk, the beach itself is what drives most visitors to the Virginia shore. My favourite American beach to date is Miami’s South Beach, partially due to its size both in length and width. 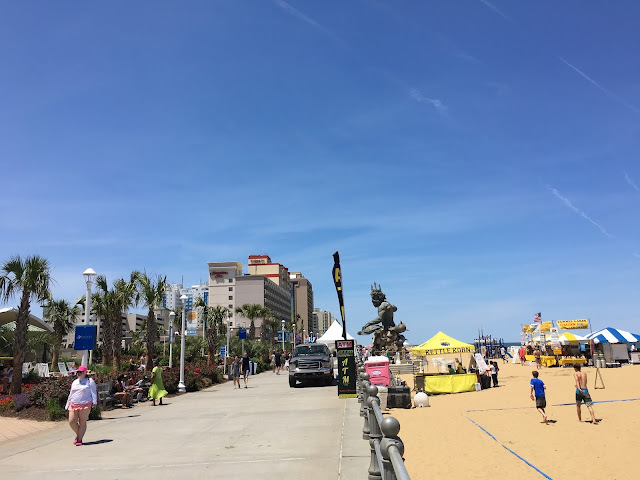 Virginia Beach is laid out very similarly, such that even on busy days there is an abundance of space to be had for all. The sand itself while not pearl white like beaches further south is very fine and soft, great for setting up a beach towel. The water is clean and refreshing, not the soup you get during a Florida summer but perfect for cooling off on an 80+ degree day. The surf varied quite a bit while we were there. Some days it being so choppy it was borderline dangerous to get in, and other days it doing little more than lapping the shore. Baby Florence enjoying her first trip to the beach! Beating the June heat in the refreshing ocean. One street west from the boardwalk is Atlantic Ave which has your usual tourist hot spots including beach wear, souvenirs & ice cream. Worth a stroll early in your trip to pick up anything you may have forgotten at home. There are a few drifters and homeless people on Atlantic as well as the boardwalk, but other than asking for change as you walk by they are not really bothersome. 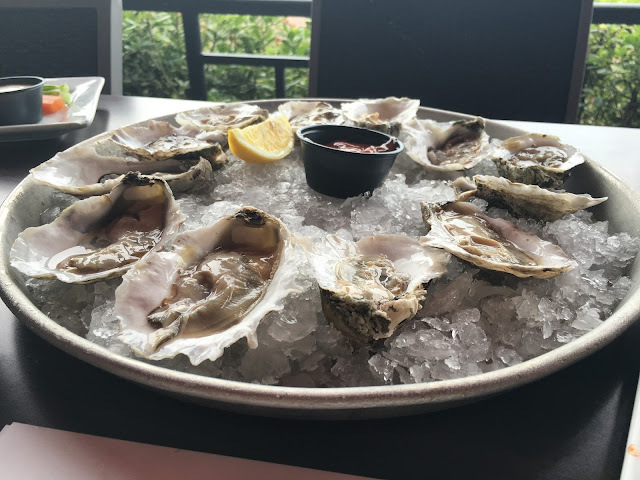 From what we were told from others who have visited Virginia Beach, (or really any beach town in the US), ‘happy hour’ eats and drinks are a must. 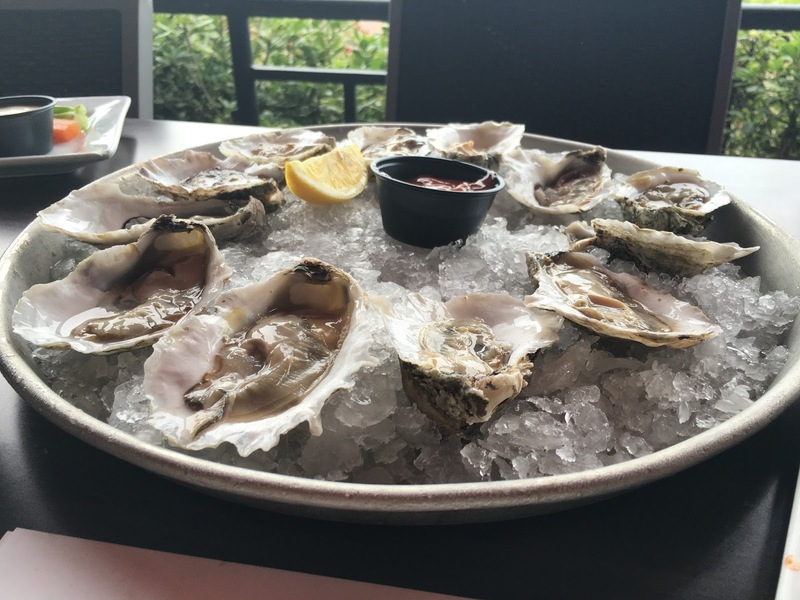 I enjoyed more than my fair share of delicious oysters and pints at Mahi Mah’s Restaurant at the south end of the boardwalk. Sadly, we were not as impressed with some of our evening dinner outings, even at restaurants very well reviewed on TripAdvisor. Lucky for us we had a full kitchen in our house and some great cooks in the family to ensure we were never short on good eats from home. Oysters, the culinary highlight of the trip! For a break from the beach and boardwalk life my father-in-law and I went on a couple cycling adventures. The first was to Sandbridge Beach just south of Virginia Beach. While it looked like a nice beach to stay at, I wouldn’t recommend traveling there for a day trip as it’s basically the same as the main beach, just without the action. The ride there wasn’t great either as about half of it was on a very busy main road. Far more cyclist-friendly routes are surely out there. 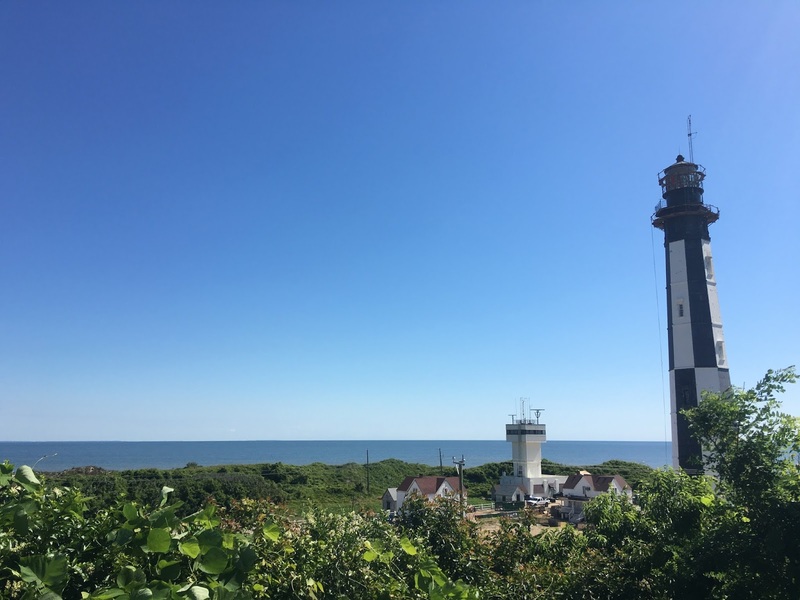 Our second outing took us 10KM north to the historic Cape Henry Lighthouse. Unbeknownst to us, you must check in at a guarded military gate before proceeding to the lighthouse. This was a little intimidating as we suddenly rode up to a group of a dozen or so military personnel, but they were very friendly and gave us all the info we needed to get to our destination. For a cost of $8.00 I was able to climb to the top which was fun and provided some nice views of Chesapeake Bay. If you have any sort of claustrophobia or fear of heights the climb may not be for you, just as a quick word of warning! There is also an abundance of outdoor activities available in nearby First Landing State Park, but we were eager to return to the beach thus did not do much after the lighthouse visit. 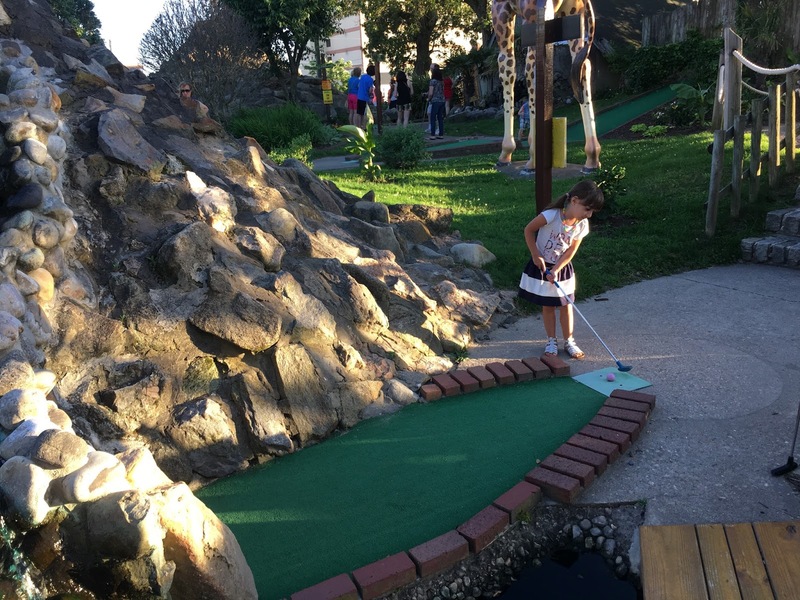 Later in the trip we played a round of jungle-themed mini golf complete with near-life size animals, palm trees, tropical mists and even a volcano! The kids in our group loved it, as did the ultra-competitive rec sports adult (me!). The new lighthouse and Chesapeake Bay as seen from the top of the old lighthouse. Sofia lining up a putt alongside a volcano! Virginia Beach is a fantastic vacation spot and perfect for young families. My beach town bucket list is still pretty full (Myrtle Beach, Panama City Beach & South Padre Island to name a few), but I know this surely wasn’t my last visit to the land of Neptune.